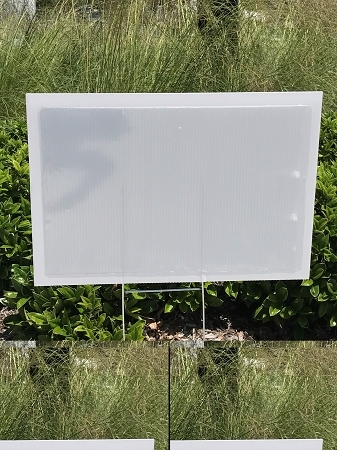 Home > Little & Big Tee-sers > BIG Teesers Golf Kit - Holds 11" x 17"
BIG Teesers will not break the budget on golf tournament signs! 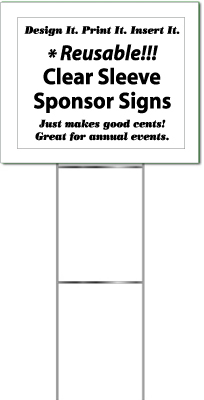 We have the solution for you - BIG Teesers do the trick without a big impact on your fund raising dollars these smaller tournament signs are just the right size and price. Got these to use for our annual golf tournament. Simple design made it easy to customize and print signs in-house on 11 x 17 paper and then slide into the display window. Was able to use these for sponsors, hole contests, directions, buy-in extra options(mulligans, helper tape, putting contest), etc. Held up well and will be great to use for future tournaments too! So glad we got these! Q: It holds a 11 x 17 sheet but, what is the total measurement of the sign? A: The sign is 14"x20" and the included stake is 6"x24"
Q: Would you be able to send me a photo of what these look like? A: I have sent you an email with the picture as well as added a picture to the product information.